First War 2 is the second part of First War game with advanced and improved features. There are also some of the enemies which are totally different from the previous version. This has been chosen as Action games because of the presence of various kinds of actions. This game is based on future warfare. 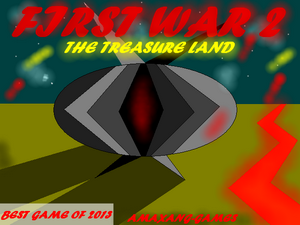 Free download First War 2 The Treasure Land full version game now. While playing the game press F1 button for more information about this game. Your mission is to collect as many coins as possible. But beware of the enemy and enemy bullets. Dynamites are need to be avoided at any cost. You have only 5 Lives to proceed with. COMPATIBILITY- Windows XP, Vista, 7, 8, or 8.1. DirectX 8 (or later) compatible graphics card(NVIDIA, AMD or Intel) with at least 128MB of memory is required for installing this game. Also a DirectX 8 compatible sound card is required. You should have 1GB RAM and 5MB of Disk space to install the game. NOTE: A little bit support, whether a purchase or sharing it, will be incredible. I will be glad if you download and play this game. All the Best!